FestBuddy is a complete solution to planning and running your beer fest. Register and track vendors and their beers. Schedule tap times, contests, and other events. And all this information ends up in the palm of your attendees' hands. No more phone calls or nagging e-mails to vendors. They can register online and see exactly what they need to be ready for the big day. Does your event have an app? 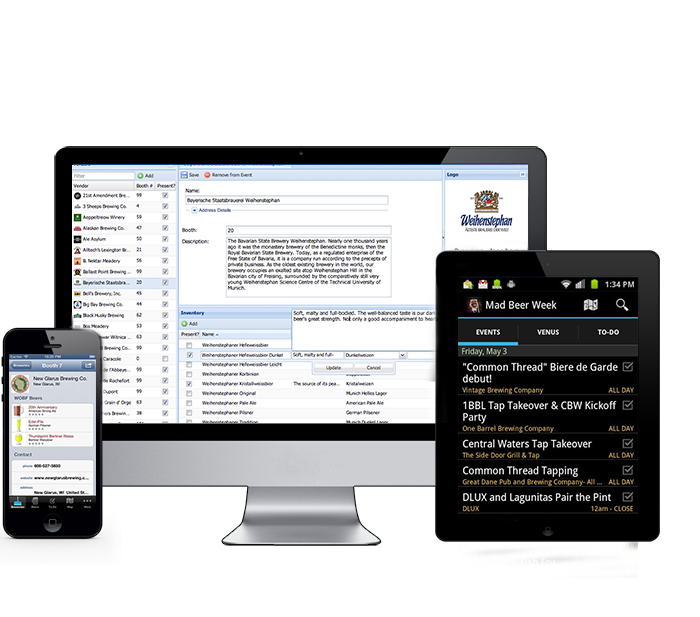 With FestBuddy it can: first class mobile apps come bundled with our management suite. You and your vendors can see and verify their beer list, brewery description, and contact information in one central place long before your event. Our team loves beer festivals, which is why we wrote this app. We're there to guide through the process and help out in any way we can - even during your event. Access to all of this starts at $1/ticket, and we can have you up and running in no time at all. Interested? Just tell us a little about your festival and we'll get in touch.